Every ice sheet has a period of advance, followed by a period of decline. During the advance, while there may be variations in the rate of movement, with slight intervals of halt or even of retreat of the ice front, the growth of the ice sheet on the whole exceeds the waste. During the retreat, while there may be like variations in the rate of movement and minor intervals of halt and readvance as a whole, the waste exceeds the growth and the ice front gradually retires from the position of its maximum extension. While the ice front was being melted back to the Valparaiso moraine and while it stood in that position, the water which arose from the melting of the ice and from the precipitation upon its surface flowed off southward and westward by various channels and eventually reached the Mississippi. This discharge and the resulting deposits of outwash gravels heading in the outer slope of the Valparaiso moraine have already been noted. When, however, the ice front first withdrew within the crest of the Valparaiso moraine, there were not such direct lines of discharge to draw off the water, so that it collected in hollows in the surface of the moraine and in a string of ponds bordering the ice front and lying well up on the inner slope of the moraine. At first these ponds or lakelets were presumably isolated and discharged over the moraine as they found opportunity. The scattered marsh areas indicated on the maps may mark the location of many of these ponds. As the ice front gradually withdrew, the ponds that were immediately contiguous to the ice edge were extended laterally and became more and more connected with one another. As lower outlets were opened the higher lines of discharge were abandoned. At length all these lakelets became coalescent into one marginal lake lying between the ice front and the inner slope of the moraine, and a line of discharge was opened along the course of the present Desplaines Valley and the Sag -- a Y-shaped outlet whose lakeward arms inclosed the trinangular morainic tract known as Mount Forest [Island]. This may, perhaps, be recognized as the initial stage of Lake Chicago. As the glacier continued to withdraw, the lake extended itself northward until it occupied an extensive basin. It seems probable that the earlier stages of this marginal glacial lake were contemporaneous with the deposition of the mild ridges of the lake-border morainic system, since it is probable that these till ridges mark stages of halt, or of halt and readvance, of the ice front in its retreat from the Valparaiso moraine. 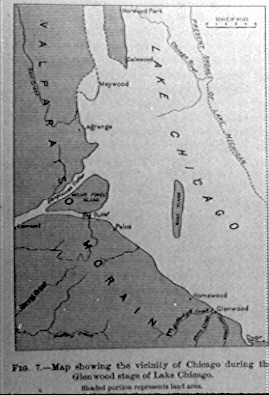 The introduction of the name "Lake Chicago" for the glacial lake which was held in the southern end of Lake Michigan Basin seems convenient if not necessary, inasmuch as its area was not coincident with that of Lake Michigan, and its outlet was in the reverse direction. It is also in keeping with the custom of students of glacial lakes who find it advantageous to have a special name for each of the temporary bodies of water in the several basins. The name "Lake Chicago" seems especially pertinent, since the glacial lake extended about as far beyond the present limits of Lake Michigan in the vicinity of Chicago as at any part of its border. It is also a name which readily suggests the position of the lake and is in keeping with the name which has come into use for the outlet. The recognition of the outlet and of the beach lines with their sand and gravel deposits as evidence of a former extension of Lake Michigan over the plain upon which the city of Chicago is now situated was made at an early date. Perhaps the earliest mention of the fact in scientific publications is that by Dr. Henry M. Bannister in his article on the geology of Cook County in Vol. 3 of the Geological Survey of Illinois, published in 1868. 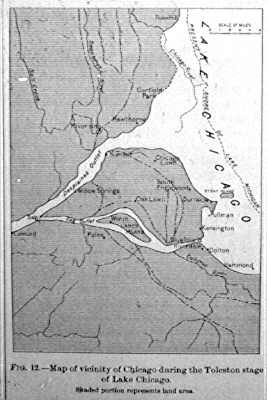 In the same year a report on the survey of [the] Illinois River by Col. James H. Wilson and William Gooding was published in the report of the United States Army Engineers, which makes reference to the former southwestward discharge of Lake Michigan. Dr. Bannister opens his discussion of the ancient outlet and beaches with the following statement: "It is evident, with very little observation, that at a comparatively recent period a considerable portion of Cook County was under the waters of Lake Michigan, which at that time found an outlet into the Missisippi Valley through the present channel of the Desplaines." The general features of the outlet have already been given. Concerning the age of the valley cut in the rock there is little direct evidence. Near Lemont the valley floor is almost bare rock from side to side, showing no filling by glacial drift. Neither does the floor in this part show glaciation, so far as known, unless the parallel grooves reported by Mr. Guthrie are of glacial origin. It seems probable, however, as indidated, that these go with the potholes in the rock near Lemont as the product of river erosion. The rock is exposed in the bluffs at this place 40 to 60 feet above the valley floor. While this rock cut may not be preglacial, it may have antedated the last glacial epoch. If such was the case the cut must have been filled with drift to a height of at least 60 feet above Lake Michigan, since this is the highest level at which the waters appear to have stood for any considerable time. The erosion of the outlet may have begun at a somewhat higher level, while yet the ice front was but little withdrawn from the moraine and while there was yet no extended lake to develop well-marked shore lines. Shore erosion would probably be inconsiderable in a narrow lake in which there was much floating ice. As the ice retired and the incipient Lake Chicago became expanded this outlet was cut down. At a certain stage in this process, represented by the highest beach, the wave action was sufficient to develop a definite beach line before the further lowering of the outlet had drawn the water down to a notably lower level. 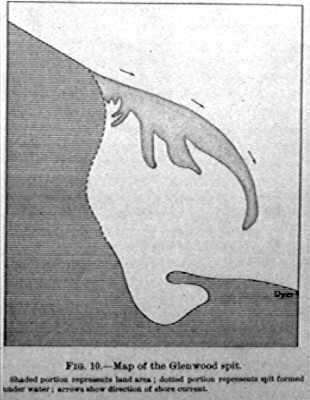 It has been suggested as not improbable that the halt at the 60-foot level was determined by the stoping process; that is, after the outlet had reached the 60-foot level, it found its channel resting upon rather resistant drift and rock from the head of the outlet nearly across the whole breadth of the obstructing moraine, while on the outside of the moraine there was a sharp descent. As a result there was, for a period, very little cutting at the entrance of the outlet, while there was comparatively swift cutting at the rapids formed on the outer siden of the moraine. These rapids gradually cut back by a process somewhat like the miner's stoping, until the rapids had traversed the breadth of the moraine and reached the head of the outlet. Immediately on doing this, the waters would be rapidly drawn off to a level represented by the foot of the stope thus carried from the outer to the inner side of the obstructing moraine. This would account for the fact that there is not a succession of beaches extending from the 60-foot horizon to the lower horizons, as there should be, one would think, if the outlet was gradually lowered the corresponding distance. Enough is known to make certain that the general direction of retreat of the ice sheet was northeastward. The southern and western portions of the Great Lake basins were, therefore, the first to become free from ice and to be occupied by glacial lakes. While the ice sheet was covering the present outlets of Lakes Superior and Michigan these lakes had no connection with each other, nor with the lakes to the east and their discharge was southward or southwestward into the Mississippi, from the present heads of these lakes. A small district west of Lake Erie was also occupied by a lake that discharged southwestward to the Wabash. Upon the withdrawal of the ice sheet from the southern portion of the Lake Huron Basin, the lake at the western end of Lake Erie became expanded and a line of discharge was opened eventually from Saginaw Bay across the southern peninsula of Michigan to the Lake Michigan Basin, and this being lower than the outlet to the Wabash, that outlet was abandoned. The waters of the Lake Huron Basin being held at a somewhat higher level than those of the Lake Michigan Basin, the flow of water was from the former to the latter. The glacial lake which discharged across the southern peninsula of Michigan extended over the district between Lake Huron and Lake Erie, as well as the Lake Erie Basin and the low district bordering it on the south and west. It apparently did not extend far into [the] Ontario Basin, as a study of moraines indicates that the ice sheet occupied that basin at the time of this discharge. It thus appears that the Chicago Outlet at one time was the line of discharge for an area much larger than the present Lake Michigan Basin. Below Lemont the bed of the outlet declines 90 feet in a distance of 25 miles. Of this fall, 76 feet is made in a little less than 10 miles, from Romeo to Juliet [sic for present-day Joliet] pool. The nature of the rock is such tat it is not probable a waterfall was established, but the high gradient must have caused very strong rapids. The outlet above Lemont is in general swept free of debris, and the ravines and gullies cut in the sides of the outlet have very slight alluvial deposits at their debouchures. There are, however, considerable surface accumulations of crystalline bowlders at some places. these are seen along the north side of [the] Desplaines River for 1.5 to 2 miles above Willow Springs and over a considerable area within a radius of one-half mile to 1.5 miles northeast, west, and wouth of the village of Worth, in the eastern part of the Sag. It has been estimated that there are in places near Worth a thousand bowlders per acre, the ground being so thickly strewn that a person can almost step from one to another over a considerable area. The tendency toward aggregation in the heads of the outlets has suggested the agency of floating ice, which might have clogged the outlets at certain seasons and allowed the dropping of the bowlders in these places. Transcriber's note: This part is just an introduction to a detailed and extensive discussion with illustration of the stages formation of the glacial lake stages of what we now call "Lake Michigan." Keep scrolling down! There were several more or less distinct stages of Lake Chicago. During the first stage which has been recognized, the Glenwood stage, its water seems to have stood about 60 feet above the level of Lake Michigan. This stage lasted for a considerable period during which the waves and currents worked along the shore lines, developing cliffs and building beaches and spits of sand and gravel. During this time it is probable that the ice front was retreating northward, allowing the extension of the lake in that direction. Following this was a stage during which the waters are thought to have been too low to discharge through the outlet to the southwest, or even to cover the Chicago Plain. On the emergence of this plain, vegetation sprang up and in the marshy spots deposits of peat were formed. The reason for this lowering of the lake level is not known. Probably the ice had retreated so far northward as to open an eastward outlet lower than that by way of [the] Desplaines Valley. Later the water rose, though not so high as before, and nearly covered the plain, burying the peat deposits under accumulations of sand, where they are now found as evidence of the low-water stage. As the water rose, the discharge through the Chicago Outlet was resumed. This rise marks the beginning of the Calumet stage, during which a second line of beaches was developed about 40 feet above Lake Michigan. The cause of this rise in the lake waters is not positively known, but it was probably due to a readvance of the ice so as to block the northeastern outlet, or possibly to a rise in the land lying northeastward, such as to cut off the discharge in that direction. Certain evidence is coming to light which may show that the lake level was lowered a second time, following the Calumet stage, by the reopening of the outlet at the northeast. The third series of beaches, which were formed about 20 feet above the present lake level during the Toleston stage, may thus really mark the extent of a partial resubmergence of the Chicago Plain after a low-water stage rather than simply a stage in the gradual lowering of the lake level by the cutting down of the outlet. Still later a permanent outlet was opened at the northeast, probably the result of the final recession of the ice. This outlet was lower than that near the site of Chicago, and the level of the lake was drawn down sufficiently to cut off the southwestward discharge. When this was done the present conditions were inaugurated and the history of Lake Chicago was at an end. The different levels at which the water of Lake Chicago stood for any considerable length of time are marked by a series of well-defined shore lines whose ridges of beach sand and gravel were noted as the significant features of the Chicago Plain. The positions of the various shore lines are indicated on the maps. As before stated, the water at first stood for a notable period at a level about 60 feet above that of Lake Michigan, or 640 above tide. At this level was formed the first and highest beach. To this beach Mr. Leverett has given the name Glenwood, from the village by that name on the Chicago and Eastern Illinois Railroad, 4 miles south of the Calumet River. At Glenwood this beach is especially well developed. The relations of land and water while the beach was forming are shown in fig. 7. The shore line corresponding to the Glenwood beach extended an undetermined distance northward into Wisconsin. It has been identified at this same level in Wisconsin northward to a point 5 miles north of Racine, where it is intersected by the present lake bluff. From this point northward through Milwaukee and Ozaukee counties, a distance of 45 miles, as far as the investigation has been carried, no trace of this shore line has been found. It is thus impossible at the present writing to say just how far northward the ice front had receded while the water stood at this level. In the Illinois portion of Lake Chicago the beach is present except for a few miles between Waukegan and Winnetka, where its absence is due to the encroachment of the waters of the succeeding lake stages upon the land, so that the present lake shore is farther west than was the shore line during the Glenwood stage. In Indiana (fig. 14) the beach is present throughout the entire extent of the border of Lake Chicago in that State, being nowehere less than 2 miles and in places as much as 12 miles back from the shore. In Michigan it is absent for a short distance at the "clay banks" north of New Buffalo, where the present shore stands farther east than the shore of Lake Chicago. It is also absent for the same reason near the line of Berrien and Van Buren counties and north of St. Joseph, and for a few miles north of South Haven. North of [the] Kalamazoo River only a brief reconnaissance has been made, so the full extent of the beaches in Michigan has not been ascertained. The location of this and the succeeding beaches in Illinois outside the special area under discussion, in Indiana and in Michigan is a result of Mr. Leverett's investigations. See The Illinois Glacial Lobe, Chapter 11. From the bluff at Winnetka this Glenwood beach swings southwestward for several miles to Norwood Park on the Wisonsin division of the Chicago, Milwaukee and St. Paul Railroad (see Riverside Areal Geology sheet and fig. 7). Extending northward between Galewood and Maywood there was a shallow bay, 2 or 3 miles in width. It is probable that when the waters stood at their highest level they extended over the plain north and west of Maywood to about the limit indicated on the geologic map and fig. 7, but the only definite indications of a shore line are at a somewhat lower level south of Maywood. It seems probable that this latter line marked the shore when the waate level had lowerr somewhat and the Oak Park spit began to emerge as a beach. From Maywood the shore line swings southwestward and southward through Lagrange to the line of the present Desplaines Valley near McCook station. Just west of McCook was a prominent point, passing about which the shore line makes for the head of the outlet 3 miles southwest of McCook. The outlet here was about 1 mile in width. The continuance of the point west of McCook in a position so exposed to erosion was probably due to the fact that beneath a thin coating of till are beds of limestone dipping down the slope. The head of the Sag outlet at the Glenwood stage was about 2 miles northwest of the village of Palos, on the Wabash Railroad, where it had a width of one-half mile. The shore between the two outlets lay along the east slope of the morainic tract known as Mount Forest. The shore line of the outlet below the villages of Mount Forest and Palos have not been differentiated on the Areal geology sheet for the various stages of the lake history. The line marking the shore has, for the most part, been placed at the foot of the present side slope of the valley. It is probabl that the outlet was widened as well as deepened during the various succeeding stages of the lake history, so that the actual shore lines were destroyed at each succeeding stage. From the Sag the Glenwood shore line passes southeastward along the inner slope of the moraine, which rises in some places gently and in others more abruptly from the plain. Passing about one-half mile north of Homewood, on the Illinois central railroad, the shore continued southeastward through Glenwood, on the Chicago and Eastern Railroad. Just southeast of Glenwood the beach deposits have been almost entirely removed by the erosion of Deer Creek, but one-half mile farther on the beach is again seen flanking the lakeward side of a sharp, narrow ridge of till. Near the State line it turns eastward and runs into Indiana through the village of Dyer (fig. 14). The Glenwood shore line has certain features which deserve special mention. Through a large part of the distance between Norwood Park and Dyer this shore line is marked by a wave-cut terrace and low cliff cut in the glacial drift, rather than by a sandy beach. 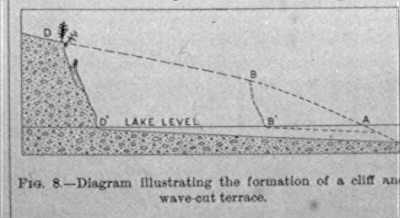 The method of formation of a cliff and wave-cut terrace is [shown on figure 8 and] as follows: D A is a land surface sloping gently to a lake the level of which is D'A, A being the original position of the shore. As the waves dash against the shore the bank is more or less eroded and the debris is either washed backward by the undertow and spread on the bottom or carried along the shore by the littoral currents, to be deposited wherever motion sufficient for its transportation fails. As the zone of greatest erosion is at the water's edge, extending a little above and a little below the level of quiet water, the shore is gradually cut backward as with a horizonal saw, the material above sliging and falling down when undercut and being worked over and carried away by the waves and currents. Thus with a land surface rising back from the shore, the shore grows higher and becomes a cliff, while the bottom of the lake near the shore slopes gently up to the water's edge, forming a wave-cut terrace. The horizontality of the landward margin, which also marks its junction with the cliff is the especial characteristic of a wave-cut terrace. It should be noted, however, that in the case of the ancient terraces from which the lake has withdrawn, their landward margins may be locally rendered uneven by alluvial fans formed at the debouchures of ravines and gullies in the old lake cliff. From Niles southward through Norwood Park to the Chicago, Milwaukee and St. Paul Railway and beyond, the Glenwood shore line lay along the east margin of a moderately high and slightly undulating tract. This tract is the southern part of the western till ridge of those which Mr. Leverett regarded as composing the lake-border morainic system. West of this ridge there was a shallow estuary 2 or 3 miles in width at the time the Glenwood beach was forming. This estuary probably extended some distance northward and brought to the lake the drainage of the inner slope of the Valparaiso moraine. In the western part of this low area [the] Desplaines River has now cut its channel. As there was little or no wave action in this estuary its shore lines except in the southern par, aree not clearly worked. Their position as indicated on the maps has been assumed from the general topographic relations. The method of building the spit is readily explained. Along the east shore of this elevated tract, through a distance of nearly 8 miles northward from its southern extremity, the waves were defeloping a wave-cut terrace with a cliff 15 to 30 feet in height. The finer material from this erosion was carried back into the deeper water, but the sand and gravel were left near the shore. A current moved along the shore in the direction indicated by the arrows (fig. 9). While flowing on the shallow bottom near the shore the current carried along more or less of this sand and gravel. 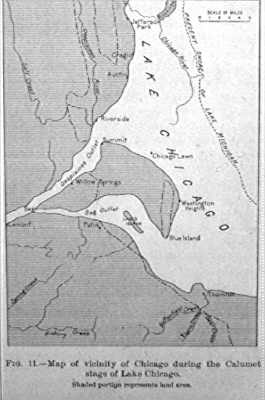 As it reached the point of land below Galewood the current continued across the estuary in the general direction already assumed, instead of following [typo in folio] the reentrant of the shore. As it reached the deeper and more quiet waters its velocity was checked, its carrying power reduced, and the load dropped. More material was constantly brought forward, being carried out each time a little farther over the deposit already made; thus a narrow submerged ridge of sand and gravel was extended out from the headland in the direction of the shore currents. As a current flows across the mouth of a bay, the swep of the winds across the open water of the lake is likely to deflect it into the bay and the spit receives a corresponding deflection. If turned in sharply it forms a hook. In the case of the Oak Park spit, the double curve is probably due to the combined action of the northeast winds and the current of outward flow from the estuary. The wind turned the spit westward until the outlet of the estuary was somewhat constricted, when the outward flow of water became sufficiently strong to deflect the spit-building current again southward. If the process of spit building continues until the opposite shore of the bay is reached the bay is completely cut off and the embankment forms a bar. When it is built up to the level of the water of quiet weather the waves of storms may throw up the material still higher and the bar becomes a shore line, with a lagoon shut in behind. Southeast of Glenwood there was a shallow bay (see Calumet Areal Geology sheet and fig. 10). The shore currents did not follow the shore of the bay, but, as in the case of the estuary near Galewood, they swept onward across the inlet, bearing the shore drift of sand and gravel with them, As the currents came into deeper water they dropped their burden of detritus and gradually built it out into a great spit, nearly 2.25 miles in length, almost shutting off the bay. The landward deflection of detritus-bearing currents by easterly winds is well illustrated by the curved form of the spit. In quieter weather the current flow, and the consequent spit building, was southeastward in the general direction of the shore line; but during periods of heavy storms from the easterly quarter the currents were deflected into the bay and the spit suffered a corresponding deflection. During storms the distal part of the spit was probably washed away and the material swept back into the bay in the form of a hook, and only with the return of more quiet weather was the extension of the spit in its original direction resumed. The structure of the whole is that of a great curved bar, formed by a series of hooks extended one from the other with the smae general front. As this bar increased in height until it stood at or near the water level it became the shore line and was further heightened by accumulations of dune sand. This ridge has now a height of 15 feet above the plain to the north and east. Beginning 2 miles southeast of the point where the Chicago, rock Island and Pacific Railway passes from the plain to the moraine, the till slope along the Glenwood shore line is more or less coated with windblown sand. About 1 miles east of Homewood this dune sand becomes more prominent, forming a well-defined ridge 10 to 30 feet in height. It is evident, however, that this deposit was formed at a later stage than the beach with which it is associated. It was blown up from a lower beach which is found only a half mile to the north. While this deposit continues eastward in a line of dunes, the beach gravels of the Glenwood stage emerge from beneath the ridge of dune sand and continue southeastward toward Glenwood. It is not known how long the waters stood at this upper level. It was long enough to accomplish considerable erosion of the outlet and of the inner margin of the moraine. Most of the debris seems to have been swept through the outlet instead of being deposited on the lake bottom. The level of the lake was probably not constant during the Glenwood stage. The outlet was being cut down and the level of the water in the lake correspondingly lowered. The amount of this lowering must have been nearly 20 feet, inasmuch as the waters of the next stage at which the Chicago Plain was submerged formed their beach at a level about 20 feet lower than that of the Glenwood stage. As the water level became lower the level of wave cutting was correspondingly lowered and more or less erosion resulted at all levels from the highest to the lowest at which the lake waters stood. The effect of this lowering is seen in the wave-cut terraces and cliffs. The landward margins of these terraces as now found, instead of rising to a uniform level 640 feet above tide, are generally somewhat lower. Because of this evident shifting in the lake level it is not possible to determine the exact initial altitude of the lake. The altitude given by the railroad surveys for Maywood, Glenwood, and Dyer is probably approximately the highest lake level. At these points, instead of cut terraces and cliffs, there are simple beach deposits of sand and gravel. The altitude at these places is 636 feet above tide. In the following table the altitudes of the cut terrace at the base of the cliff shows approximately the lower limit which the lake level reached during the Glenwood Stage. Altitudes of cut terraces along Glenwood shore line. No satisfactory evidence has been found of life in the waters of Lake Chicago at the Glenwood stage. This is as would be expected in waters largely derived from the melting of the great ice sheet. Shells have been reported from the gravel pit of Mr. Haas a Forest Home Cemetery, 1 mile south of Oak Park, but as there were many Indian graves on the bar which extended down nearly to the level of the base of the pit, it was concluded that the shells might have been introduced in connection with some burial. Mr. Haas also preserved fragments of the tooth of a mammoth found in the gravel pit at the depth of several feet. These fragments are waterworn, and it therefore seems probable that they were introduced during the formation of the bar. So far as known, no other evidences of life have been found in the deposits of this stage of the lake. Supposed Unio shells have been reported found in a marsh on the inner side of the beach north of New Buffalo, Mich., but the report has not been verified. During the Glenwood stage the Chicago Plain was submerged beneath 10 to 60 feet of water, which discharged westward in a great river filling the outlet from side to side. The lakeward arms of this Y-shaped outlet converted Mount Forest into a triangular island 6 miles long and 4 miles wide. The undulating surface of this island rose 80 to 120 feet above the surrounding waters. Other than Mount Forest the only emerging land within the Glenwood shore line in the area here described was Blue Island, the ridge of drift already mentioned. There seems to be no assignable reason why excessive deposition should have occurred at this place. As stated, Mr. Leverett has suggested a correlation of this ridge with the middle ridge of the lake-border morainic system north of the Chicago district. It is probable that, as left by the glacier, this elevation of drift spread out to the east, north, and south with more gentle slopes, such as are now seen on the west, thus forming a broader and less abrupt rise than the present. At the Glenwood stage of the lake this drift ridge was an island rising 10 to 35 feet above the surroundinng waters. The waves beating against this shore on the east and northeast cut away much of the gentle slope and developed a terrace and cliff. The waters from the east and southeast were divided in their flow toward the outlets by this ridge, one part sweeping about the north and the other about the south end. These currents gathered up much of the finer material from the erosion of the cliff and swept it out to the leeward of the island in a pair of spits, one at the north end and one at the south (see Calumet Areal Geology sheet). That at the north is best seen at the Catholic cemetery at Ste. Marie, on the Chicago and Grand Trunk Railway. It may be that the bowlders on the plain at the north end of the Blue Island ridge are the remnants from this erosion, being the coarser material which the waves and currents were unable to carry. The waters flowing about the south end of the island formed the deposit of gravel and sand on which is built the village of Blue Island. These gravels are best seen in the excavation just west of the Chicago, Rock Island and Pacific Railway station, where they are alternately fine and coarse, with cross bedding dipping to the west. Cellar excavations also show the bedding as dipping to the south and west. From this deposit a gentle ridge or spit runs northwestward nearly 2 miles in the lee of the south end of the island. Along the east side of the island, where the waves began to drag upon the gently rising lake bottom and formed a line of breakers, the shore drift was built into an outlying sublittoral ridge or barrier. There were two stages in its development, forming an inner and an outer ridge of sand and gravel. The outer one is that whose margin is followed by Prospect avenue in Morgan Park and Washington Heights. These ridges curve into the shore of the island at the north and south. As the water level lowered they inclosed small lagoons which left a deposit of rich black loam over the surface of the till. The Vincennes avenue ridge, which seems to be correlated with a later lake stage, has corresponding relations inclosing the ridges just noted and extending 1.5 miles farther south before coalescing with the till slope. Its construction may have begun at this stage as the outermost barrier, later, on the lowering of the water level, it became a beach line. The beach gravels along the west side of the island are buried beneath the accumulation of dune sand just noted. The presence of the beach deposit below the dune sand is shown by the wells. The low stage of Lake Chicago marked by buried peat beds. An excellent exposure of the structure of the bar noted above is found immediately north of Evanston where the lake is undermining the bar as well as subjacent deposits. The beach sands and gravels rest upon a bed of peat, which was noted by Dr. Andrews and interpreted by him to be the accumulation of a marsh or partially submerged land surface. The peat not only underlies the bar under discussion, but extends eastward across the interval between it and the Third beach. Its level is no higher than that of the Third beach, being but 12 to 15 feet above the present level of Lake Michigan. The peat is in places several feet thick, but at the point where the bar comes out to the lake shore it has a thickness of only 3 to 6 inches. It contains pieces of mangled wood and has been disturbed by waves. Between the peat and the yellowish-blue till which forms the base of the exposure there is a gravelly sand 6 to 18 inches in thickness, which appears to be a lacustrine deposit. The peat is immediately overlain by about 3 feet of sand, above which there is a bed of coarse gravel. The gravel is thin near the borders of the bar, but has a thickness of 11 to 12 feet beneath the highest part. It is capped by a thin deposit of sand and has layers of sand interstratified with it in its thickest part. The presence of this gravel makes it impossible to suppose that the old land surface has been buried by the drifting of material form the lower beach. There seems no escape from the conclusion that the lake stood at a lower stage than the level of the second beach before that beach and the bar under discussion were formed. This beach was formed at the second succeeding lake stage, the Toleston stage, hence the soil (9) and the peat bed (7) may have been formed during an interval of emergence between the Calumet and Toleston stages. It is possible, however, that they were formed during this interval of emergence between the Glenwood and Calumet stages. It is stated that peat deposits have been reached in sewer ditches in Hyde Park, west of Grand Boulevard, beneath the deposits of the Toleston stage. It is possible that these also may be referred to this first interval of emergence. Mr. Leverett finds evidence of emergence in the deep channels along the lower courses of the streams tributary to Lake Michigan on the east, and he reports peaty material underlying beach gravels near Michigan City, Ind., Certain evidence in Wisconsin also points to an interval of emergence. Some of this evidence points to more than one interval of emergence, but further study is necessary for a satisfactory interpretation. During this interval of emergence the formation of the deposits of dune sand probably took place along the west side of the Blue Island ridge. The flat west of the ridge had recieved a considerable deposit of sand during the Glenwood stage of the lake, and when the lake waters subsided this sand was readily blown up by the wind and lodged long the west slope of the ridge. For about 1 mile at the north the accumulation is in individual hillocks or dunes, with the more gentle windward slope to the west. These dunes have reliefts of 15, 20, and 25 feet. The line of the Chicago Terminal Transfer Railroad runs through them, giving some good sections. These sections show fine, clean, buff unstratified sand. Southward the deposit takes the form of a ridge 10 to 30 feet high and 100 yards to one half mile in width, running the full length of the island. Here also the more gentle slope is to the west. This deposit gives evidence of prevailing west and southwest winds, as at present. These dunes are now covered with vegetation and have become fixed, i.e., the sand is no longer shifting. Following the interval of emergence, the waters of Lake Chicago rose and again flooded the Chicago Plain. This resubmergence may have been due to a return of the glacier to the northern end of the basin, blocking the outlet which had been opened in that direction, or it may have been due to a rise of the land in that direction. The level to which the water rose in this second stage is marked by the Second or Calumet beach which is found 35 to 40 feet above the present lake level and about 20 feet below the beach of the Glenwood stage. This beach has received its name from [the] Calumet River, with which it is closely associated in Illinois and Indiana. The name was proposed by Mr. Leverett. The lack of evidence that the waters rose higher than this beach level at this time seems to indicate that during the Glenwood stage the outlet had been cut down nearly to this level and had drawn down the lake from its highest stand. Like the older beach, this lower and later beach has its correlative in Wisconsin. A beach had been recognized at a point 30 miles north of Milwaukee at the same level as at Chicago, but from this latitude southward to a point 5 miles north of Racine, a distance of nearly 50 miles, it has been cut away by the encroachment of the lake upon the land in later times. From the Wisconsin line southward to [the] Chicago River the Calumet beach is closely associated with the Glenwood beach wherever the latter remains. South of [the] North Branch of [the] Chicago River the beach is seen in good development at Jefferson Park (see Riverside Areal Geology sheet and fig. 11). Thence it passes through Cragin and Austin to Riverside. Through this distance of 12 miles there is a continuous, well-developed beach ridge of sand and gravel. In the northwestern part of the village of Riverside it has a relief of 10 to 12 feet above the plain to the east, but southwestward throught the village this line is only faintly marked. This is largely due to obliteration by the grading of streets and lots. At this stage of the lake the drainage of the region to the north and west along the line of [the] Desplaines River, and possibly along the line of Salt Creek, entered the lake at the present point of confluence of these streams. It has been suggested that Salt Creek at one time reached [the] Desplaines Valley through Flag Creek Valley, which passes southward from Fullersburg. This may have been the case at this time. It is difficult to determine when the diversion of the stream was accomplished, if such was realy the case. Flag Creek Valley may have been a line of marginalglacial drainage at a certain stage in the retreat of the ice front. From Riverside to the outlet, the head of which at this stage was at Summit, the Calumet shore line is not well defined. At the Glenwood stage, Mount Forest Island and Blue Island were separated by an expanse of water. At the Calumet stage the intervening plain emerged and thew hole area formed one large island between the heads of the outlet (fig. 11). Sag Bridge station marks the western extremity, Summit the northern, and Blue Island village the southeastern. The flat part of this island may at times have been submerged during this stage, since its elevation is very nearly that of the lake surface at this time. The east shore of the outlet was not at first coincident with the side of the valley as now seen, but lay upon the flat to the east at distances varying from a few yards to one-half mile from the present cliff. Its position is marked by an interrupted deposit of sand and gravel. The outlet at Summit was about 1 mile in width. From Summit southeastward the lake shore line swung in a broad curve about the north end of the Blue Island ridge and through Washington Heights. Throughout this distance of 11.5 miles the Calumet beach is marked by a continuous well-developed ridge of sand and gravel 5 to 10 feet high and 50 to 100 yards wide. North of Archer avenue, in the village of Summit, there is an excellent 15-foot section showing the structure of the beach. The material ranges in size from coarse sand to pebbles 3 and 4 inches in diameter. It is well assorted and stratified in beds dipping northward at an angle of 10 degrees. From Washington Heights to the village of Blue Island the outer of the barrier ridges previously mentioned marks the shore line at this stage. This is the ridge now traversed by Vincennes avenue. The head of the Sag outlet at this stage may be considered as lying between the south end of the Blue Island ridge and the inner margin of the moraine about 3 miles farther south. The waters passing through this outlet were divided by a low body of land known as Lanes Island. This has a width of one-forth to one-half mile and a length of 3.5 miles. Its outline is traced by a low, narrow ridge of beach sand and gravel. This island was submerged during the Glenwood stage, but the lowering of the waters left the crest slightly exposed. Stony Creek now traverses the north cahnnel. The total width of the Sag outlet, including Lanes Island, was nearly 3 miles. West of this island the channels unite and the outlet was contracted to a width of one-half mile. The village of Oak Lawn stands on the north shore of the north channel, and the village of Palos near the south shore of the south channel. The shore lines are for the most part clearly marked. From the south side of the Sag outlet to the rock elevation at Thornton the Calumet shore line was nearly parallel to that of the preceding stage and about one-half mile within it. Southeastward to the line of the Chicago, Rock Island and Pacific Railway the shore line is rather obscure, but from this railway to Thornton there is a continuous ridge of beach sand and gravel. There is also considerable sand spread over the plain within this beach line. From the Thornton rock elevation, whose north margin formed the shore, this shore line continues eastward into Indiana (fig. 14). East of Thornton the beach gravels are largely covered by dune sand. For some distance the beach gravels are exposed along the south margin of the dune-sand deposit, which gives to the south side rather than the north side the appearance of being the shore. Upon entering Indiana the beach follows the south border of the Calumet River across Lake County and Porter County to the point where the upper beach passes to the north side of the river. It is closely associated with the upper beach from near the village of Ross, Indiana eastward. It is also closely associated with it for several miles east from the point where it crosses the Calumet River, but in the vicinity of Furness the two beaches become separated by a newarly level swampy tract about one-half mile in width, and continue distinct to Trail Creek, just east of Michigan City. The Second beach passes through the south part of that city. Upon passing into Michigan this beach becomes so greatly obscured by the belt of dunes formed along the border of the lake that exposures are found only at a few points. In several places in Berrien and Van Buren counties it was recognized and found to ahve an altitude 35 or 40 feet above Lake Michigan. Northward from Van Buren County, Mich., no detailed location and examination of the beach has been made. 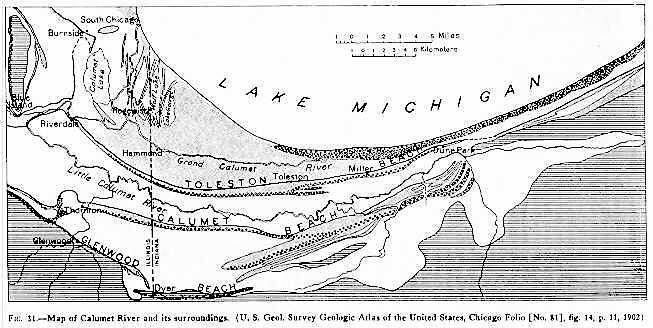 During the Calumet stage a slight spit was formed near Cragin (see Riverside and Chicago Areal Geology sheets). This shut in a small lagoon and its east front eventually became the shore line. At Washington Heights a spit extended southeastward in continuation of the shore line from Summit. The trend and structure of the spit shows that the effective shore work was done by waves and currents under the influence of the strong northeast winds, rather than by the currents flowing toward the outlets. The well-developed bar between Washington Heights and Riverdale gives this line much the appearance of having been the shore line, and indeed it may have been such during the latter part of the Calumet stage, with the head of the Sag outlet between Riverdale and Thornton. A careful consideration of the relations, however, seems to indicate that at least during the earlier part of the Calumet stage the shore line lay along the Vincennes avenue ridge between Washington Heights and the village of Blue Island. As indicated, the beach gravels of the Glenwood stage east of Homewood are buried beneath a deposit of dune sand. This was evidently blown up from the lower beach during and after the Calumet stage. The deposit consists of ridges and hillocks of fine, clean sand 20 to 30 feet in height. These dunes are now well covered with vegetation, so that the sand is no longer shifting. The extensive deposit of dune sand east of Thornton is largely in parallel ridges, the formation of which probably began during the Calumet stage. These ridges are also very largely covered with vegetation. From a point on the Calumet beach north of Chicago there extended into the Chicago embayment at this stage a conspicuous bar (fig. 11). Its northern end is found at the present lake shore between Wilmette and Evanston. Its connection with the Calumet shore line was destroyed by the encroachment of the waters of Lake Michigan upon the land. From this point it runs southward through the western part of Evanston, and on it, near its southern extremity, is Rose Hill Cemetery. At the south end this bar has a relief of 15 to 20 feet and a breadth of three-fourths of a mile. Beneath this bar, as already noted, were found the peat deposits which give evidence of an interval of emergence between the Glenwood and Calumet lake stages. In respect to the remains of life, this beach is similar to the upper beach; no evidence of a definite character has been secured. The occurrence of shells in the Calumet beach deposits at Summit and near New Buffalo, Mich., has been reported, but no definite information has been obtained concerning them. The only shells found upon this beach by the writer were on the farm of Mr. J.H. Welch, about 1.5 miles southwest of Chicago Lawn, in a field about 80 rods northwest of the point where the beach ridge is cut by the Belt Railway. Numerous molluscan shells and one specimen of coral were found, having been plowed up from the top of the beach ridge, but the presence of the coral and the fact that the shells were, without exception, of marine species render it improbable that they were remains from the life of Lake Chicago. Pelecypods: Ostrea virginica Gmelin, ranging at present from Prince Edward Island to the West Indies. These specimens are very largely perforated by boring sponges, Area transversa Say, ranging from Cape Cod to Key West. Venus cancellata Linn., ranging from Cape Hatteras to Trinidad. Venus mercenaria Linn. Pecten (sp. ?) possibly Chlamys irradians Linn., a fragment. Gnathodon cuneatus Gray, Gulf of Mexico. Gastropods: Fulgur perversus Linne, ranging from Cape Hatteras to Cuba. Cerithus (sp. ?) apient whorls only found. Cerithiopsis (sp. ?) apical whorls only found. Corals: Oepitina? robustus Pourtales, West Indies. However, the facts that from time to time suggestions of the former occurrence of marine waters in the vicinity of Chicago have been made, and that a certain line of evidence bearing on the question of a post-Glacial submergence of the continental interior seems to be developing may warrant the citing of the conditions of occurrence of these specimens with a view to possible future value as evidence, when correlated with other data, and to bringing forth confirmatory or adverse evidence bearing on the question. The specimens found were largely in the shape of smoothly waterworn fragments, more or less thoroughly perforated by boring sponges. Many of the fragments yet reatined their natural tints and luster. The specimens evidently had not been brought into the fragmental condition by the plow and harrow, as the fragments were well smoothed and the recent fractures easily recognizable. Mr. Welch stated that he, himself, cleared the ridge of its native trees and underbrush, broke the sod, and has lived there for nearly thirty years, that he never used any fertilizer containing shells, that he has plowed up the shells and from time to time picked up the more perfect specimens as curiosities. He stated that the only evidence of Indian residence he has ever found on the place was a single arrow head. The trading of the Indians with the south and east is well known, yet the greater part of the specimens found seem too fragmental and imperfect to have served as Indian ornaments. Also, very delicate, tiny shells were found in the sand, filling the coils of one of the larger gastropods. The southern range of al the species found would seem to preclude their having been brought here by drift from the northeast, or having lived in the arm of the sea that penetrated the St. Lawrence Basin from the northeast, for all the shells found in this basin by Drs. Bell and Ells, or by others, are arctic species. These plants are arrow grass, Russian thistle, sea rocket, beach plum, beach pea and seaside spurge. This list of plants is kindly furnished by Dr. H.C. Cowles, at the University of Chicago. It should be stated, however, that Dr. Cowles gives little consideration to them as evidence of former marine conditions here rather considering it as begging the question to regard plants with such a wide range along the interior lake shores as strictly seashore plants. In the discussion of the low-water stage between the Glenwood and Calumet stages, reference is made to certain phenomena which indicate the possible occurrence of a second low-water stage following the formation of the Calumet beach, during which the northeast outlet was reopened and the discharge through the Chicago Outlet ceased. At the present writing, however, this evidence is not considered conclusive. If such a low water stage occurred, it was followed by a partial resubmergence of the Chicago Plain, due to the closing of the outlet to the northeast, and the southwestward discharge through the Chicago Outlet was resumed. This outlet had been so far cut down during the Calumet stage that the thrid recognizable shore line is found at a level about 20 feet above the present lake. The beach formed at this stage of the lake has been called the Toleston beach, from the village of Toleston in northwestern Indiana (fig. 14). The relations of land and water at this stage, so far as the vicinity of Chicago is concerned, are shown on the Areal Geology sheet and in fig. 12. Remnants of a terrace at a level corresponding to this shore line have been seen at various points north of Milwaukee, Wis. Between Milwaukee and Kenosha, Wis., it has been almost entirely destroyed by the encroachment of Lake Michigan upon the land. From Kenosha southward to Waukegan, Ill., it is well developed and is followed closely by the line of the Chicago and Northwestern Railway. Thence southward to Evanston the encroachment of the lake has removed all trace of this beach, as of the earlier beaches. At Evanston, on the grounds of Northwestern University, this beach appears at the present shore line and runs southward along the eastern border of the Rose Hill bar. The low area west of Rose Hill was probably flooded for a time at this stage. From Rose Hill to Hawthorne the shore line is poorly marked. Traces of it are seen at Milwaukee avenue and North avenue, at the rock elevation near the intersection of Chicago and Western avenues, and southwestward from the corner of Douglas and Central Park boulevards. From Hawthorne, which marks the north side of the head of the outlet at this stage, to [the] Desplaines River 1 mile north of Summit, the shore is well defined by a sandy beach. From Summit southwestward toward Willow Springs the shore of the outlet of this stage is marked by the 15 to 20 foot drift bluff now followed by Archer road. From Summit eastward there is a cut terrace and bank; in places it is barely traceable. From one-half mile west of the intersection of Western avenue and Garfield boulevards this shore line is marked by the strong ridge of sand and gravel which passes in a broad curve southeastward through Auburn Park to South Englewood. In the earlier part of the Toleston stage the shore line seems to have swung off to the south and southeast near the intersection of South Halsted and Eighty-seventh streets, and passing through Fernwood at Stewart avenue and One hundred and third street, turned southward along the till cliff which passes through Kensington to [the] Calumet River at Riverdale. The Sag outlet, probably not a very active line of discharge at this stage, seems to have occupied the present course of [the] Calumet River (reversed) between Riverdale and Blue Island. The head of the outlet was narrow and was soon blocked by a bar formed of shore drift from the erosion of the Kensington cliff. West of Blue Island the channel was divided as before by Lanes Island, now considerably enlarged by the lowering of the surrounding waters. From Dolton southeastward into Indiana the line of the Toleston beach is marked by an extensive deposit of sand and gravel. The position of the shore line, as indicated on the map, was probably coincident with the earlier-formed and stronger-developed of the compels series of ridges here formed. The beach sands and gravels are now largely covered by dune sand. From the position of Rose Hill Cemetery, where the Rose Hill bar was deflected to the southwest, the shore currents continued southward, deposition their material in a great bar over most of that part of the city of Chicago which lies between [the] North Branch of [the] Chicago River and Lake Michigan (see Chicago Areal Geology sheet). The elevation which this deposit made is traversed by North Clark street, and about midway of its length is Graceland Cemetery. As this bar extended southward and increased in height it finally became the shore line, and cut off whatever part of the bay lay to the west. This bar is readily traceable to a point about 1 mile south of Lincoln Park. It is said to have been nearly or quite continuous through the city, but now as the result of city improvements, it is scarecely recognizable for a distance of 4 miles southward. From Groveland Park, at Cottage Grove avenue and Thirty-fourth street, it extends southwestward a distance of 7 miles, through the northwestern part of Washington Park, Englewood, and Auburn Park to South Englewood, where it unites with the Toleston shore line above described. The structure of this bar southwest from Groveland Park is that of a series of overlapping hooks, with their distal extremities turned into the bay at the west, extended southwestwaard one from another with the same general front, inn the manner already described. A deposit of sand about 1 mile in width is spread over the bowlder clay west of this bar. The advance of this bar constricted the channel of free flow toward the outlet; at the same time the lowering of the lake level diminshed the outflow in that direction, so that the current was unable to keep a clear channel and the bar was finally completed across the by to the farther shore at South Englewood. This is the most notable instance, within the area studied, of the cutting off of embayments in the simplification of shore lines. The southern part of the area west of this bar eventually drained out to the east through the depression now occupied by the Auburn Park lagoon, and the establishment of [the] Chicago River probably drained the remainder. It was probably while this bar was being built and the outflow to the west diminished that the present outlet of the lake to the northeast was being established. As the flow to the north increased, that by way of the Chicago Outlet diminished. At the Toleston stage of the lake Stony Island had begun to emerge as a reef or an island and its position (fig. 12) gave it a controlling influence on the currents. Under its protection the currents that were shifted southward by the extension of the bar just described began to work upon the gentle till slope, and a terrace and sandy beach were developed from South Englewood through Burnside to the lee of Stony Island. These southeasterly currents were here met by westward currents south of Stony Island, and the drift was turned abruptly southwestward toward the site of Pullman. With the lowering of the lake level this new line became the shore and the original line through Fernwood was abandoned. The relations of the line through Fernwood to that through Burnside are somewhat obscure. 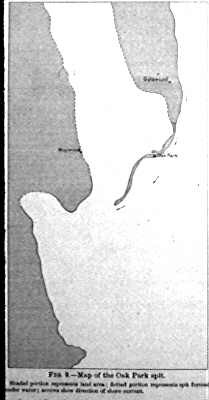 The large island formed at the Calumet stage by the emergence of the area between Blue Island and Mount Forest Island was still larger during the Toleston stage. This was the necessary result of the lowering of the lake level. In striking contrast to the Glenwood and Calumet beaches the Toleston beach contains abundant traces of life closely related to the life of Lake Michigan, if not identical with it. As one of the best exposures of the structure of the Toleston beach, Mr. Leverett has given, with the section observed in 1864 by Dr. Oliver Marcy at the border of the campus of Northwestern University at Evanston, the following section observed by himself in 1887 after the lake had encroached 75 to 100 feet upon the land. 1. Yellowish-red, iron stained sand 3 to 5 ft.
2. Band of bog iron ore, granular 4 to 6 in. 3. Gravel with beds of sand included (the stratification is very irregular in thickness, and assorting very imperfect. 5 to 7 ft.
4. Coarse sand, not calcareous 6 to 12 in. 7. Carbonaceous band, not calcareous 2 in. Molluscan shells have been found at many other places on this beach. The occurrence of the bones of a mastodon at the south side of Wicker Park near Milwaukee avenue, about 1 and 1/8 miles east of Humbodt Park, has been reported. The bones, consisting of part of a jaw, teet, and parts of a few other bones, now in the collection of the Chicago Academy of Science [sic], are said to have been found beneath 13 feet of silt. Whether these specimens are to be correlated with the beach deposits at this place can not be definitely determined, thought they were said to occur on the soil corresponding to No. 6 of Dr. Marcy's section given above, overlying the peat horizon. This ends part 4 of The Chicago Folio by William Alden, 1902.